To Download "Right Click" link and select "Save Target As"
Matthew attended church at St. Paul's in Decatur and grade school at the Lutheran School Association (LSA). He developed an interest in pastoral ministry at a young age, while attending the LSA, was confirmed at St. Paul's, with the class of 1997 on March 16 and graduated from the LSA that spring. He then attended and graduated from Decatur Christian High followed by Concordia University, Wisconsin. 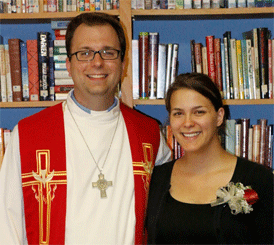 He received his Bachelor's in Pastoral Ministry in the spring of 2005. From there he attended Concordia Seminary in St. Louis. Matthew spent the third year of his seminary training serving as a vicar at Pilgrim Lutheran Church in Green Bay, WI. Matthew would go on to graduate with his Master of Divinity from Concordia Seminary on May 22, 2009 after having received a call to serve as Pastor at River of Life Lutheran Church in Rogersville (Springfield), Missouri. Matthew was installed as River of Life's pastor on July 19, 2009. He was blessed to be their shepherd for the past five years. It is with great gratitude and thankfulness to you all that we are able to celebrate this God given milestone this day. We wish to thank everyone who helped in the service today and the reception. May God continue to bless your service to Him!